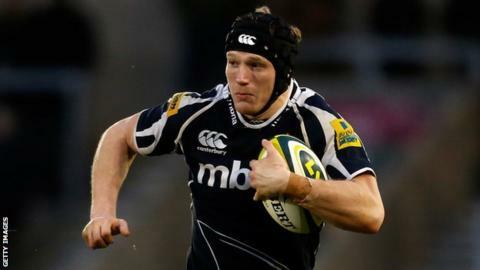 Wasps have completed a deal to sign Sale Sharks' Kearnan Myall for next season, and have extended the contract of fellow lock Marco Wentzel. Myall, 26, has played 23 games for the Premiership's bottom club this season. The ex-England Saxon joined the Sharks from Leeds in 2011 after the Yorkshire side's relegation to the Championship. Two-time South Africa cap Wentzel, 33, is a former Leeds team-mate of Myall's and has featured 23 times for Wasps this term. Wasps are well resourced at lock, with England internationals Joe Launchbury and Tom Palmer on their books, as well as James Cannon, who has made 23 appearances this season. Director of rugby Dai Young told the club website: "Second row is a real physical position and there's a long season there, so making sure we had a very strong mix in this area was important to us and we've got that now. "Marco has been a huge performer for us over the past two seasons and continues to be a real leader for us at the lineout and it's great to have him on board next season again. "Kearnan is someone who has been an ever-present for Sale and someone who has really impressed us. "I believe he is a player who has the potential to go further in his career and earn greater international recognition."